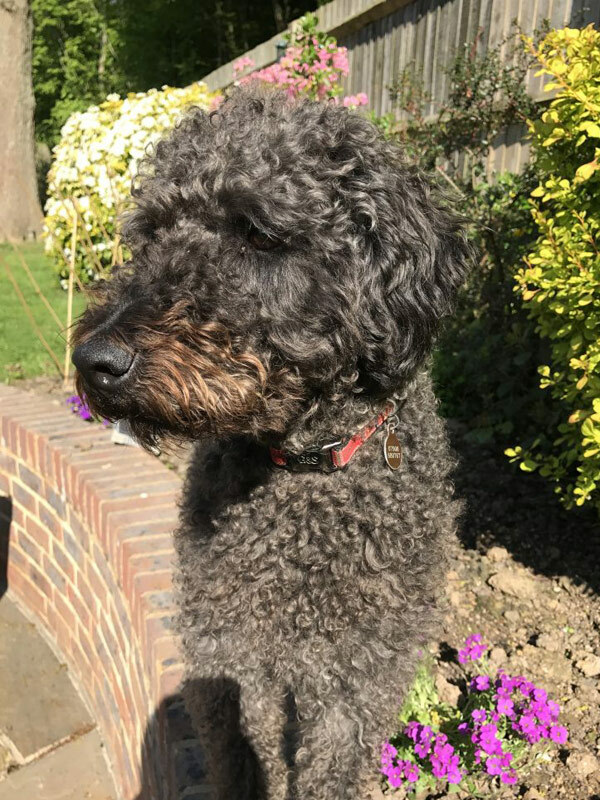 I tell everyone that I am a Black Labradoodle, but between you and me, I am grey with a patch of black on my back and a very fetching ginger moustache. I have heard my human companions call me an expensive mongrel, I think it is a term of endearment. I am 2 years old and spent the first 2 years of my life quietly with my humans in Sussex, then 2 months ago I was put in charge here (I think the humans think they are in charge – ha, ha). I also have 3 new doggie companions, Queenie, Harriet and Jean, who live with our wardens here at Manleigh. Let me tell you a little bit about my human family, they are Steve and Judith who live with me all the time and then there is Megan (my bestest friend in the world) who visits regularly but lives in Sussex. They all think they are in charge, but believe me there is only 1 person in charge here and that is ME! Manleigh Park is set in the North Devon countryside on the edge of Exmoor and just 10 mins from the beach at Combe Martin. I am spoilt for choice with places to walk and at this time of year I am even allowed to go for a run on the beach. In my Blog, I will be giving you regular updates as to how I am getting on running the place. I will also tell you about places I have visited and give you ideas for lovely doggie days out when you come to visit me. I should probably warn you that at the moment I am quite excited about my new life and regularly give in to my Poodle roots which allow me to bounce very high from a standing start, I am also rather skilled at walking across the room on my back legs. My humans say I will calm down and get used to my new life, but I’m not so sure myself – It’s all so exciting. I promise to try really hard to behave when you come to visit. My favourite pastime is having fun, which I have heard referred to as ‘being a pain’. I am very talented at throwing things, but if you throw something for me I am unlikely to bring it back to you. I like to paddle in the sea but I’m not a good swimmer, apparently I’m a bit of a wimp. I am an avid wildlife spotter, my favourite being a squirrel, the very mention of the word sends me running up and down looking out of all the windows whilst singing and barking. I thought you might like to see a photo of me as personally I think I am quite a handsome chap. I hope to meet you all soon, but in the meantime, I will update my Blog to keep in touch with you.